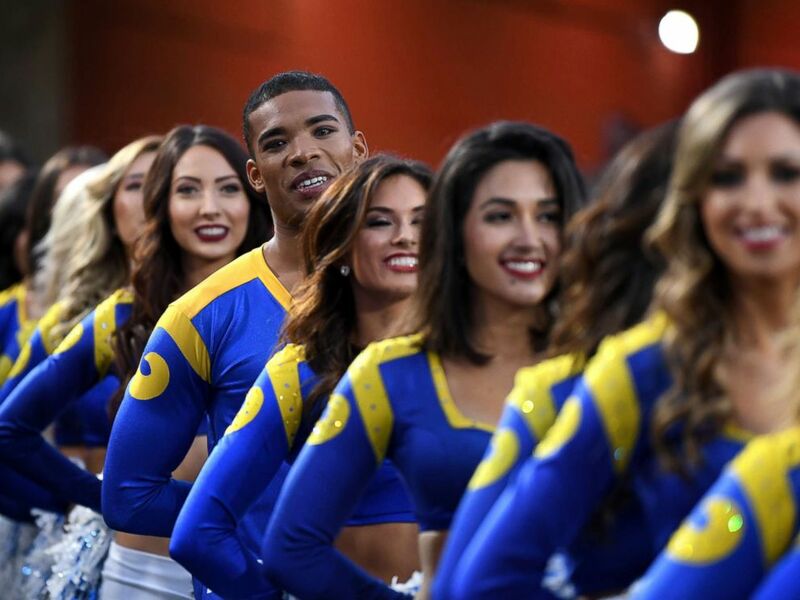 Los Angeles Rams cheerleaders Quinton Peron and Napolean Jinnies will make NFL history yet again. Add Super Bowl as an interest to stay up to date on the latest Super Bowl news, video, and analysis from ABC News. This time around, they will be the first-ever male cheerleaders to perform at the Super Bowl. The two men and their coach, Emily Leibert, told "GMA" Thursday that going to the Super Bowl feels "like a fairy tale," but it's a result of hard work. Quinton Peron, Napolean Jinnies and their coach Emily Leibert talk to "GMA" about their upcoming trip to Super Bowl 53. "It's been a crazy 10 months. Dancing hard and really engaging with our community and our team and supporting our players," Jinnies said. "I can't believe that we made it to this point, so I'm pretty sure it's showing off that we've been working pretty hard." 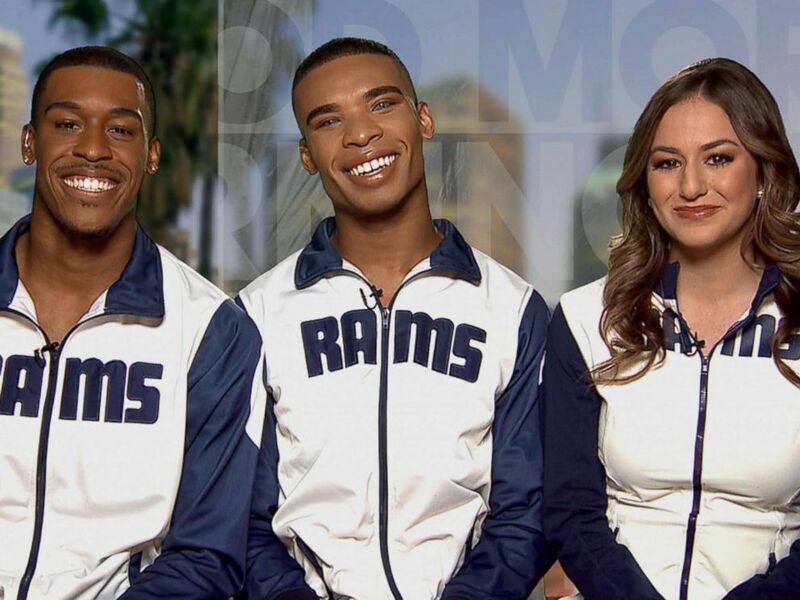 Peron and Jinnies made history with the L.A. Rams' 2018 cheer squad back in March when they were officially announced as the newest members after a rigorous audition process. With that, they became the first male cheerleaders with the NFL. Other than the upcoming trip to the Super Bowl, Peron said the most surprising part of this season has been the support from L.A. fans. Los Angeles Rams cheerleader Napoleon Jinnies dances during the game against the Arizona Cardinals at Los Angeles Memorial Coliseum, Sept. 16, 2018, in Los Angeles. "We have the best fans ever, so supportive and just everyone's so excited to see us," he said of his first season on the sidelines. Their coach said it has been "really incredible" to have both Peron and Jinnies so heavily involved in community events off the field as well. 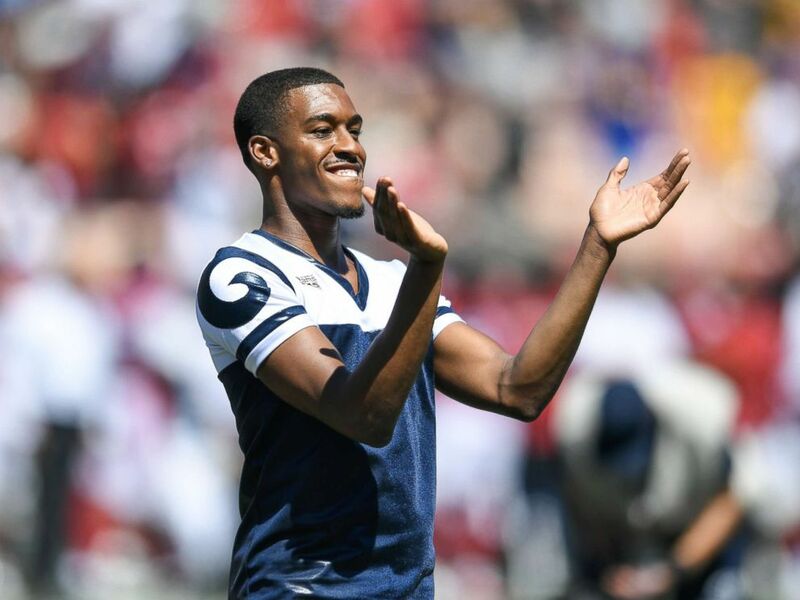 Los Angeles Rams cheerleader Quinton Peron, one of the first male NFL cheerleaders, cheers ahead of the game against the Arizona Cardinals at Los Angeles Memorial Coliseum, Sept. 16, 2018 in Los Angeles. "To see the way that they've been embraced by their fans is pretty unbelievable," Leibert said. "They're extraordinary in that they're trailblazers but they're also totally normal teammates and they fit right in, and I think that the fans have embraced them as such." After the Rams' 26-23 victory over the Saints, despite a controversial non-call, Peron took to Twitter and posted a photo of the two mid-performance with the caption, "Aye Napoleon, you think Atlanta is ready for us?" Jinnies responded in kind with a tweet of his own expressing his excitement and disbelief at the incredible year of accomplishments. 2019 first male cheerleaders dancing at the Super Bowl. Peron said he "definitely" noticed their first season has been a catalyst for other men in the sport. Los Angeles Rams cheerleaders wait to perform in the NFC Divisional Playoff game against the Dallas Cowboys at Los Angeles Memorial Coliseum, Jan. 12, 2019, in Los Angeles. "I think we can both say that we've been reached out to by so many men that are so excited to try out, not just men our age but young men trying out for the junior high school cheer team, and it's exciting to see this change," he said with an ear-to-ear smile. 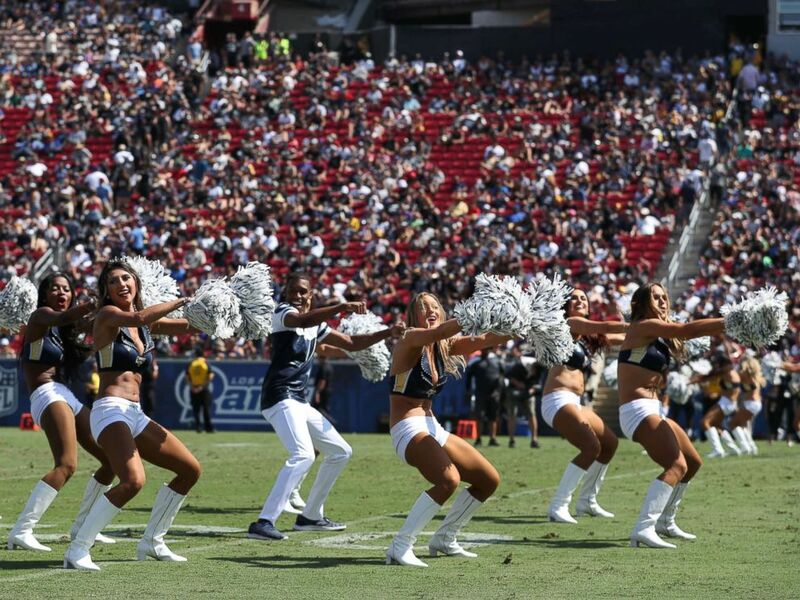 Quinton Peron performs with the Los Angeles Rams cheerleaders during the game between the Los Angeles Rams and the Oakland Raiders at Los Angeles Memorial Coliseum, Aug. 18, 2018, in Los Angeles. The squad will cheer on the Rams as they face off against five-time Super Bowl champion New England Patriots on Sunday, Feb. 3, in Atlanta. And according to Peron, "We gon' win, boy!"